First my apologies for being late with posting. I hadn't time, because of very busy days at work and at home. Today I love to guide you to one of the most famous and wonderful spots of Japan. Even Basho praised this spot for its beauty. 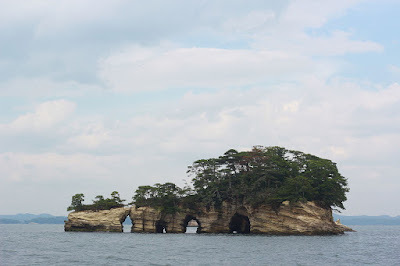 Today we will visit Matsushima. Matsushima is a bay in Miyagi prefecture - 25 km from the prefectural capital, Sendai - that is famous for its view of over 260 tiny pine-clad islands - "matsu-shima" meaning "pine islands." It is considered one of Japan's Three Great Sights (Nihon Sankei), and its beauty was immortalized in one of wandering haiku-master Basho's most famous poems. This very rural area, with a local population of less than 20,000, is also famous for the delicious oysters farmed in the bay, and for its colorful Obon lantern festival in August. In Basho's "Oku no Hosomichi", "The Small Road Into The Deep North", he describes in a very detailed way how Matsushima looks. This episode is NOW OPEN for your submissions and will remain open until February15th at noon (CET). I hope to be on time tomorrow.